My parents visited Yugoslavia, as it then was, some forty years ago, and took masses of photographs. This summer I signed up for a tour of Croatia and neighbouring republics, eager to see Split and Dubrovnik for myself, and find out what had changed in the interim, with the death of President Tito and the collapse of the Yugoslav state. We flew into Dubrovnik airport and embarked on a coach drive to our first base, which was at Omis, some distance to the north. 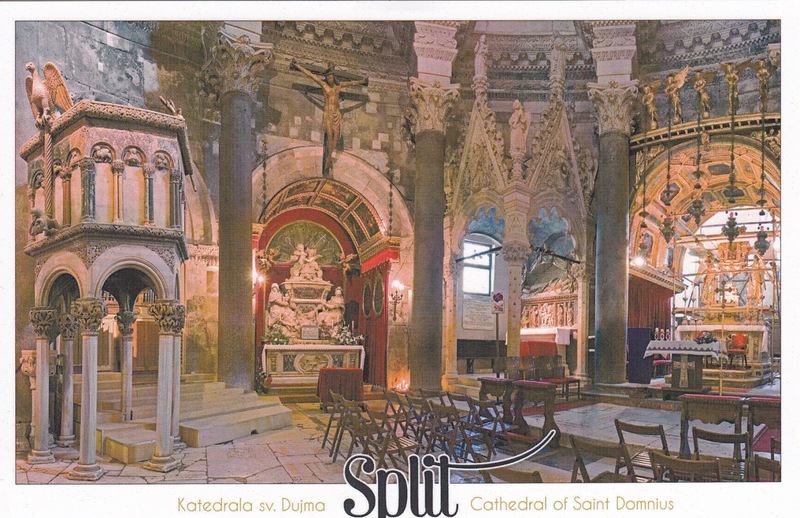 This took even longer than appeared likely on the map, because it is not possible to drive very far northwards along the coast from Dubrovnik whilst remaining in Croatia. Soon you come to the small resort town of Neum, which Tito had granted to Bosnia. Going through two border crossings within a handful of miles necessitated stopping the coach for passport checks. We had to go through this process several times in a week, and it was impossible to predict how long one would take. Would the officials scan each passport individually, or wouldn’t they bother? Also, Croatia and Bosnia now have their own currencies, though Bosnia also accepts Euros. (Montenegro is different again, as we found out later). Eventually we arrived at Omis. My parents’ guidebook from the 1970s dismissed this as a scruffy place, but now it has new hotels along the beach, with a network of tiny stone alleyways behind. The setting is dramatic, being overlooked by massive cliffs. It lies on the estuary of the river Cetina, and in earlier centuries was the home of notorious pirates who preyed on Venetian galleys sailing down the Adriatic, and then retreated upriver out of sight behind deep limestone gorges. We took a boat-trip to these waters. Nowadays the overwhelming majority of businesses are cafes, restaurants and tourist shops; but our hotel, the Plaza, was comfortable, with a good selection of food. There is a castle above the town, but I didn't climb up to see it. Our first expedition was to the Krka national park, inland from Split. The this part of Croatia proved to consist of rough scrubland, with few trees more than 6 feet high, with plenty of bare rock showing. We were told that wildfires were common. I saw signs of stones having been piled up for field boundaries and terraces, but these appeared to have been abandoned. Krka park consists of a large area where the river tumbles over a series of small waterfalls, and a broadwalk meanders through the woods and across the many small streams. It was all very pretty. The water was very clear, slightly blue, and there were plenty of fish to be seen, though not, unfortunately, any of the terrapins, frogs or snakes also advertised. Next day we drove north to Split; a fair-sized town with a harbour and sea-front promenade but unpleasant suburbs, famous for Diocletian’s palace. Diocletian was a native of the district: a rough soldier who rose to be Roman Emperor and revived the crumbling empire in the late 3rd century. 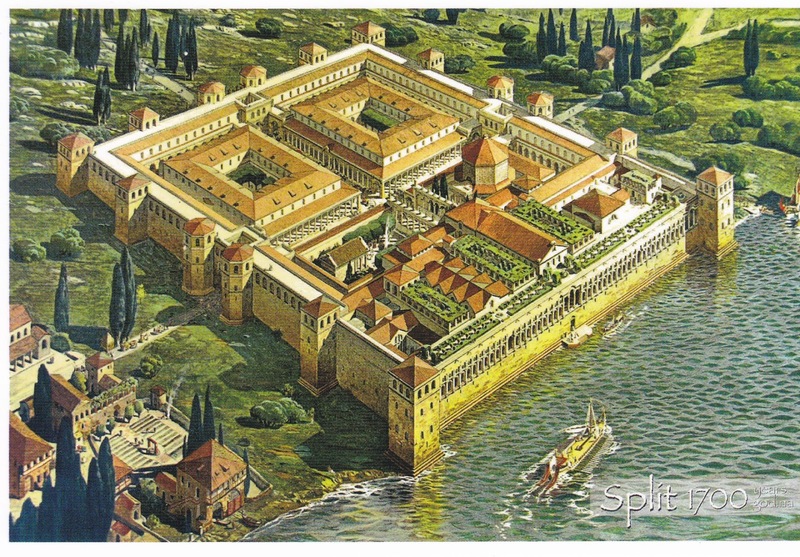 He then, uniquely, abdicated and retired to his homeland, where he built this huge rectangular structure which more resembles a fortified military camp than a palace as we would understand the term. and alleyways laid out in a regular grid pattern. 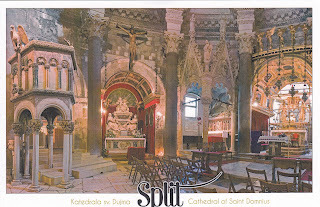 Diocletian was the last great persecutor of Christians, so it was ironic that his mausoleum at the heart of the palace was later converted into an ornate cathedral. The peristyle and vestibule next to the cathedral must be the most photographed places in the country, and it was a shame we couldn’t get a better view of them. But alas, there was a new invasion of barbarian hordes, in the shape of several huge cruise ships had anchored in the harbour, and we had to elbow our way through dense crowds, particularly of Chinese intent on taking selfies in front of any place of interest. It was amazing that we all kept in touch with our guide and didn’t get lost. 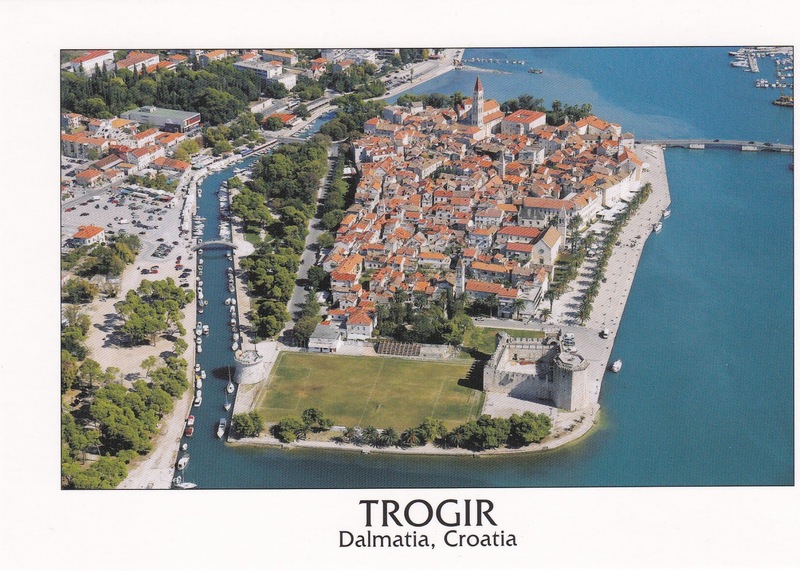 After some time wandering inside and outside the palace, our group reassembled and were taken a few miles along the coast to Trogir, a mediaeval city on a small island reached by a single bridge. Fortunately there were fewer tourist parties about. Like every other place we visited, the construction was of a particularly hard white limestone, with the streets polished like marble by the feet of generations of visitors. 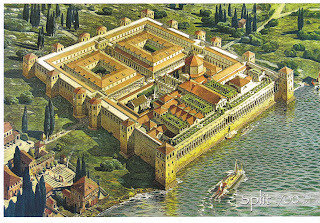 There was a Venetian fortress at the western end. 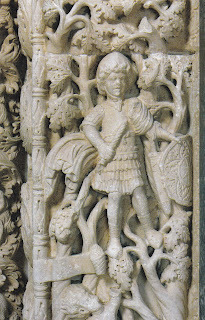 The cathedral was particularly fine, with splendid carvings around the west door. I climbed the hazardous steps up the campanile for a view over the town. On the next day, a Sunday, we said farewell to Omis and passed through a very long tunnel through the mountains en route to Bosnia. (Technically we were to enter Hercegovina, a matter of considerable importance to the inhabitants). As soon as we crossed the frontier, the sparsely inhabited grazing-land was replaced homes with small market-garden plots, notably of tobacco. There was also a profusion of car-breakers’ yards: we were told that most of the stolen cars of Europe ended up in these. Finally we reached Mostar, just before midday. The city is built in a bowl in the mountains, and is incredibly hot. 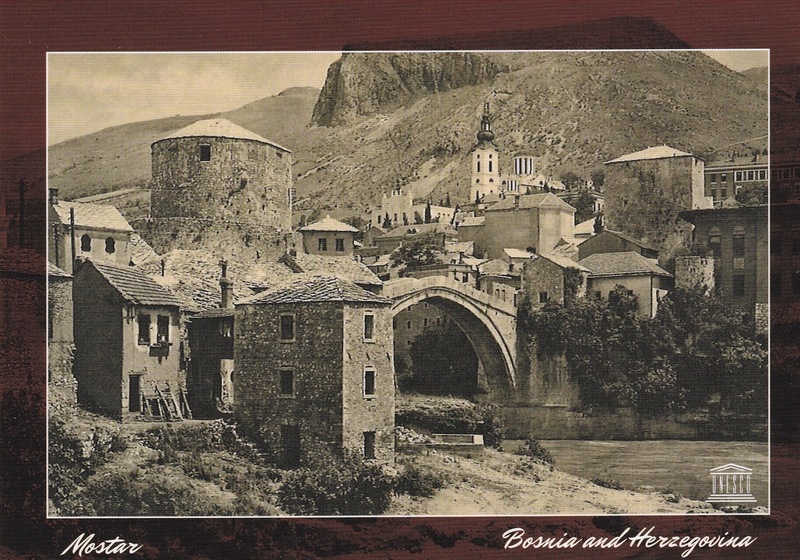 It used to be a city with a mixed Moslem and Christian population, famous for its bridge over the river Neretva, constructed for the Sultan Sulemein the Magnificent in the 16th century. The bridge was deliberately destroyed by shellfire in 1993, in the wars that marked the disintegration of Yugoslavia, and a replacement, closely copying the old bridge, was opened in 2004. Nowadays the city is segregated, with Christians on the west bank and Moslems on the east. A new Franciscan monastery has been built, with a tower deliberately planned to overtop any of the Turkish minarets. Despite the heat I climbed the minaret of the Koski Mehmet Pasha mosque to get the best view of the bridge and the city. Then we drove south, once again passing through Neum, to reach our next base, at Dubrovnik. I shall describe this in my next entry. Just read the LLandudno mine entry, amazing what people will do.